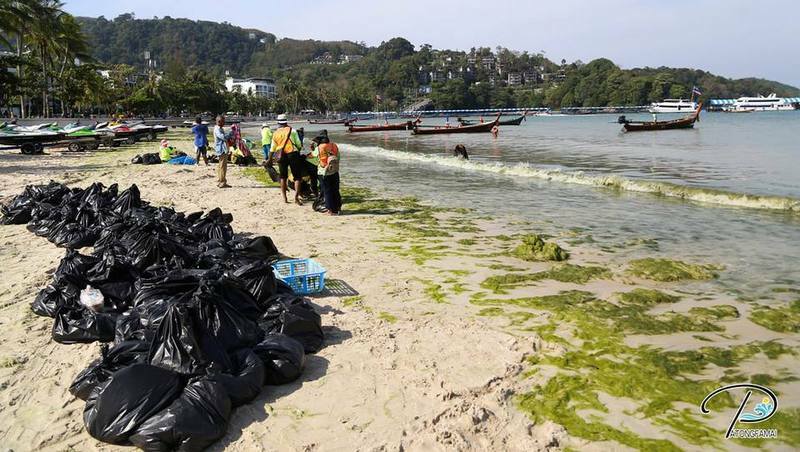 PHUKET: A mass of green seaweed that washed up on Patong Beach yesterday (Jan 21) is harmless, according to marine biologist Dr Jiraporn Charoenvattanaporn. 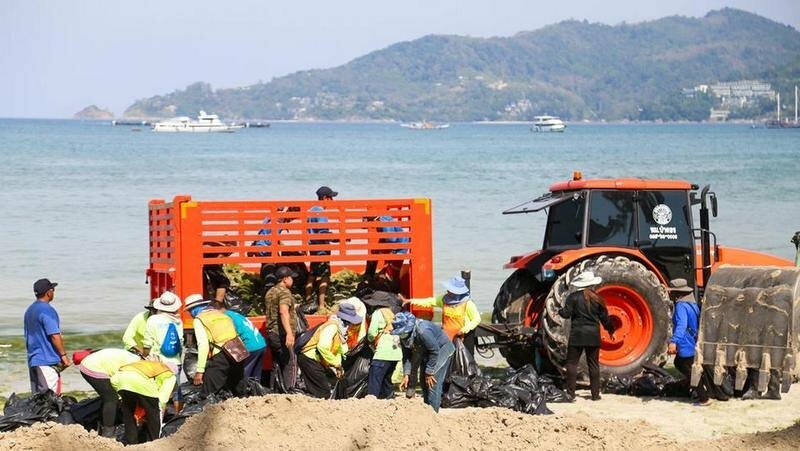 Over one kilometre of the seaweed was washed up on Patong Beach, sparking Patong Mayor Chalermluck Kubsub to order a big clean-up operation. 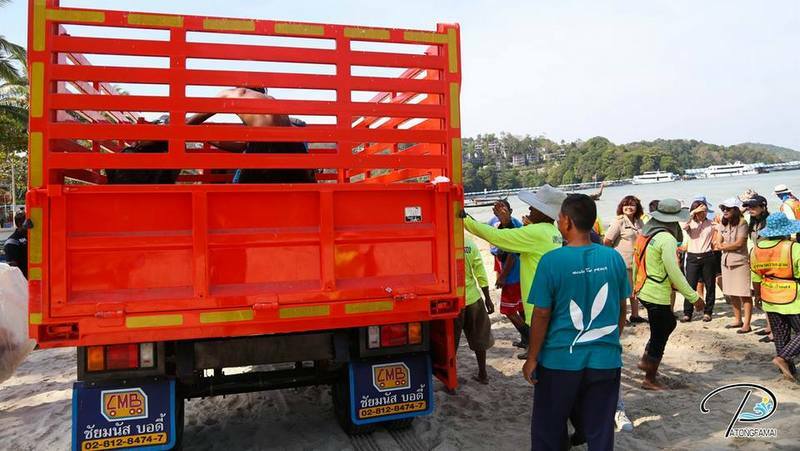 The mayor led officials from the Department of Sanitary Engineering and the Ministry of Public Health to the beach where they found far greater than normal amounts of seaweed on the shore. 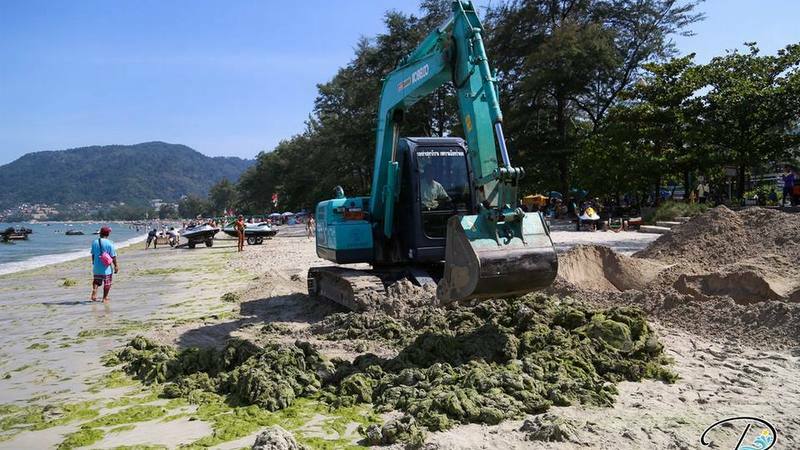 Officials began clearing up the seaweed yesterday and continued this morning as Mayor Chalermluck ordered backhoe loaders to be brought in for the operation. Dr Jiraporn Charoenvattanaporn, a marine biologist who specialises in the study of phytoplankton diversity and red tide phenomena at the Phuket Marine Biological Center (PMBC), told The Phuket News today, “The green seaweed on Patong beach is not harmful for the skin, although small marine organisms in seaweed could cause the skin to itch. “Seaweed can rot and smell bad which is not nice for people on the beach. 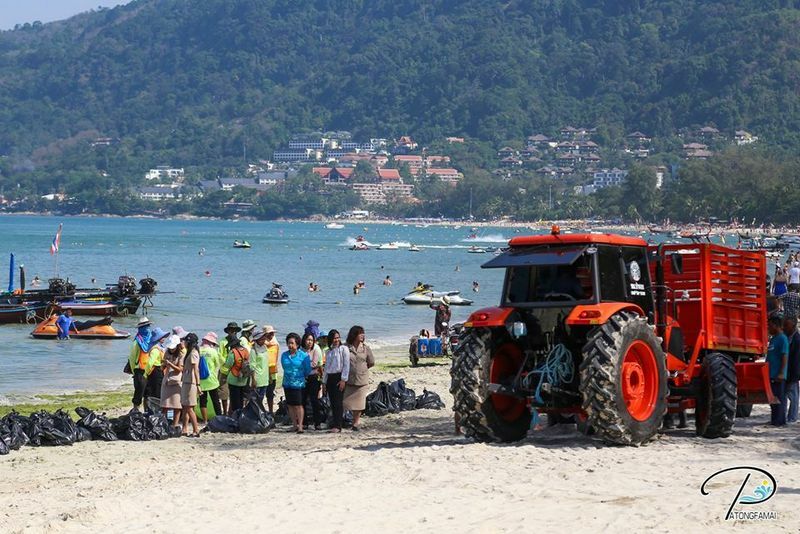 Removing the seaweed is a good short-term solution.” Dr Jiraporn said. “The seaweed would have washed up on the beach due to strong waves tearing it off of the substrate on which it grows.” She added. What a relief. It only smells, is harmless, but can cause the skin to itch. Is this safe seaweed not eatable? A extra dish for on the tourist restaurants menu's? Yes, the seaweed is safe. The water that allowed it to grow, isn't.